Slide frames were oh-so-cool back in the day. I remember making my own slide prints in elementary school and having a lot of fun with it. So we’re bringing back the old school by doing some frame effects in the Mixbook Creator tool. – Frames can be made thick or thin, and give a different feel to each photo. – The color of the frame can drastically affect what the photo looks like, just like a matte (in a real framed photo) does the same. – Pairing a frame with a matching or contrasting background can highlight the colors in the photographs. This simple frame trick makes photos look like they are individual slides and focuses the eye on the main subject, which is the photo. 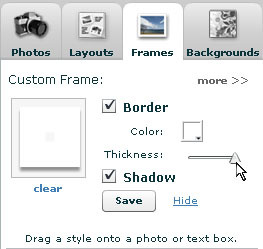 – Simply click on the “Create Custom Frame” button in the Frames section of the tool. – Increase the thickness to the highest setting by dragging the tiny arrow all the way to the right, until it is 8.00 in thickness. – Change the color of the frame if you wish, or leave it at white — which is clean, bright, and usually works with any photo. 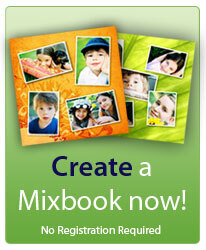 – Drag the photo frame to your layout for the book page, and re-center your photos where they need to be. – Finish by clicking “Save” to save the frame to your drawer for later use! This is just a little exercise in fun, to change the look of a page by mixing up the thicknesses and colors of the frames. 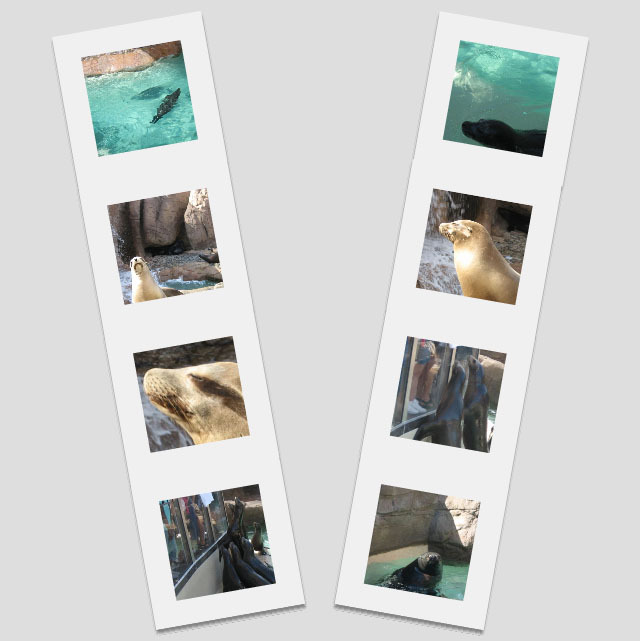 – We used the same method as the “Photo Slides” trick only we used the thinnest setting for frame as well and changed the color to match the blue water. 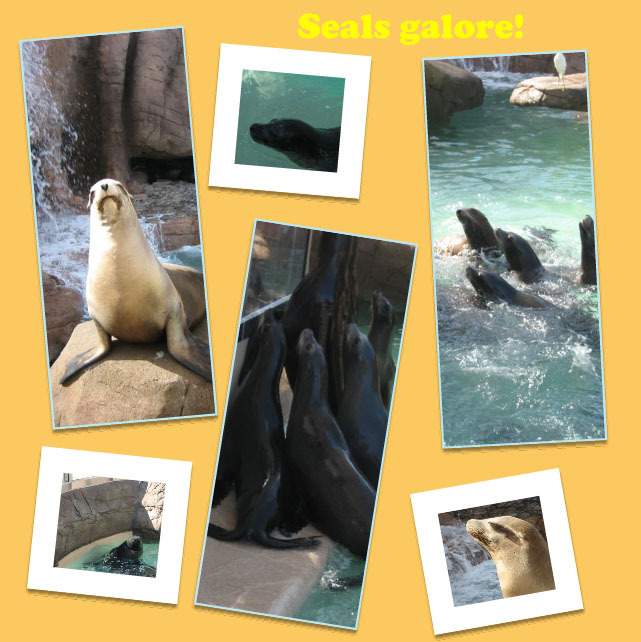 – This page is fun because of the bright background color contrasting with the dark skin of the seals, and the placement of the different frames. Try mixing your own combination of frames and remember to save the styles to your drawer so you can play with them again! On special occasions what better gift to give than a lovely memento that will remind the recipient how wonderful and blessed the event was … this Mixbook was a sweet sentiment from one friend to another before a wedding. 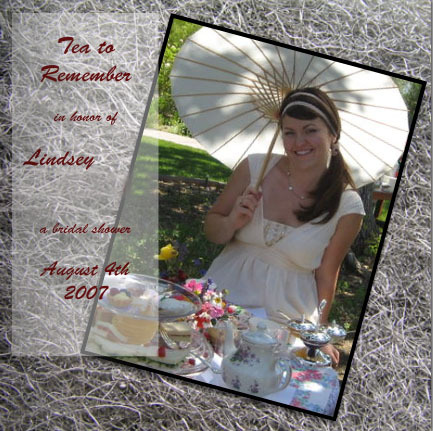 This particular event was a bridal shower tea, but there are endless possibilities. Birthday parties, baby showers, bachelor parties, high school dances, summer camps, and more! Mixbooks are inexpensive, and for one very good reason. We wanted to be able to make a lot of books about anything we wanted — for a good price. So that’s why we created a soft cover collaborative photo book. So go ahead, make Mixbooks just because. Document your life and finally print out those digital pictures that you have been waiting to see.